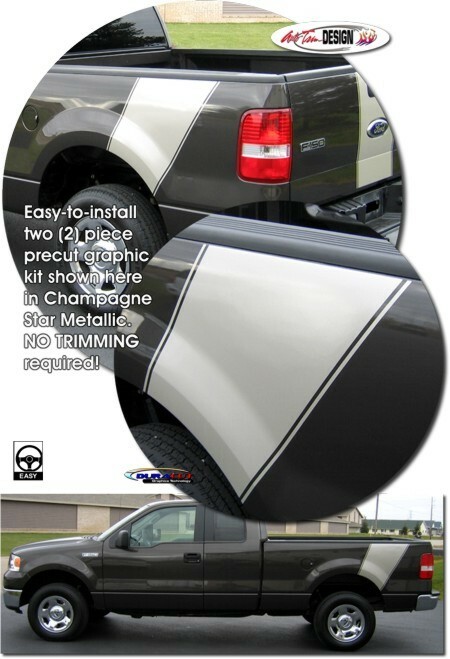 Set your '04-Current Ford F-150 apart from the rest with this unique Rear Bed Side Sport Graphic Kit. This easy-to-install kit is packaged as a set of two (2) pieces with a classic 0.30" (7.62mm) pinstripe at each side as shown. They're PRECUT and ready to install in a wide variety of colors - NO TRIMMING required! Graphic kit consists of prefitted and contoured pieces as shown in the illustration. Kit is specifically made for the '04-Current Ford F-150 Styleside bed sides (5.5', 6.5' and 8') and will not fit any other vehicle. For F-150 models with painted factory Wheellip Moldings, you may consider our two (2) piece Factory Wheellip Trim kit to complete the installation. Please Note: Premium vinyl graphic materials may not adhere sufficiently to unpainted Dark Grey molding surfaces. Trimmable Wheel Flare Kit includes two (2) 16.498"x 9.829" (41.90cm x 24.97cm) pieces and four (4) 16"x 0.30" (40.64cm x 7.62mm) pinstripes for aftermarket fender flare applications.